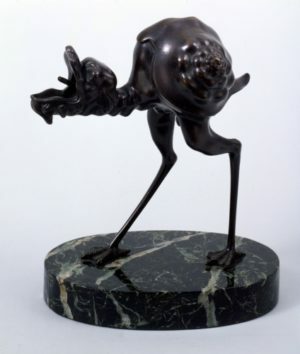 The model for this curious creature can be traced to a series of drawings of grotesque beasts, in the then fashionable auricular (or ‘ear-like’) style, by the Dutch designer and silversmith Van Bolten. The finest of the many casts may have been made by him or at least during his lifetime. It seems probable, however, that the majority – including this one – were made much later, perhaps even in the 19th or early 20th century, when they first appeared in large numbers on the art market.